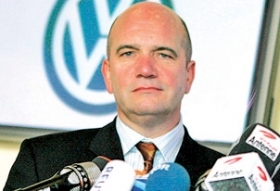 Osterloh: VW needs to be able to take decisions quicker. WOLFSBURG, Germany (Reuters) -- Volkswagen Group needs to come up with a new structure before thinking about appointing a permanent chairman, VW's powerful labor chief, Bernd Osterloh, said. "We want to first have a debate about the company structure, then we can talk about a supervisory board chair," Osterloh, who is head of VW's works council, told Reuters. For the first time in more than two decades, Volkswagen no longer has Ferdinand Piech at the helm. Piech controlled the balance of power between the interests of shareholders and workers representatives. Analysts and investors had hoped for the appointment of a strong chairman to work with CEO Martin Winterkorn to tackle some of the company's problems, such as a low profitability at the core VW brand, which posted an operating margin of 2 percent in the first quarter. Since Piech was ousted in April, Volkswagen's workers representatives have sought to exert more influence over strategy, to strengthen the focus on raising production efficiency without cutting jobs. Winterkorn promised to present a new company structure by October after surviving a showdown with Piech in April, thanks to support from Osterloh and the State of Lower Saxony. Workers representatives control half the seats on VW's supervisory board while Lower Saxony, which owns 20 percent of the company, has another two seats, meaning they could potentially veto any candidate for chairman. The power vacuum at the top comes at a crucial time for Volkswagen. The company wants to raise profits and boost sales in the United States in a bid to overtake rivals such as Toyota and become the world's best-selling automaker. In the past, Piech played a key role helping to chart the carmaker's strategic direction, first as chief executive and then as chairman. Piech masterminded a push into so-called modular construction techniques and bought truckmakers MAN and Scania, as well as Bentley, Bugatti, Lamborghini and Porsche. He also took the Audi brand upmarket. In a bid to improve profitability, VW has long faced calls to cut fixed costs in Germany and improve production efficiency at its factory in Wolfsburg, where 50,000 of its nearly 600,000 employees around the world work. Osterloh and representatives from Lower Saxony, where Wolfsburg is based, have been opponents of any such cuts and are now in a stronger position, since Winterkorn relied on their backing to fend off Piech's challenge. Rather than opening the door to deeper cuts in Wolfsburg and other German VW plants, Osterloh's proposals for a new structure would further centralize power at the company's Wolfsburg headquarters. For example, he wants the company's 12 brands to stick to specifications set out by headquarters so VW can benefit from economies of scale across the board, rather than making costly modifications to suit the needs of individual brands. "Corporate headquarters needs to be able to supervise whether the technical specifications of the modular platforms have been adhered to," Osterloh said. He is also demanding the management board be reduced and the corporate structure be adjusted to reflect the company's various modular production platforms: MQB for small to mid-size cars, MLB for larger vehicles and MSB for sports cars. At the moment, Volkswagen Group's structure is devolved and based around its various brands such as Audi, Lamborghini, Bentley, Bugatti, Skoda, Seat, Ducati, MAN and Scania. "The company needs to be able to take decisions quicker and needs a smaller management board. Regions need more competence to take decisions," Osterloh said. Volkswagen's management board is made up of nine members and includes positions responsible for procurement, China, commercial vehicles, production, sales and Audi. Osterloh declined to elaborate on how the board should be reduced, but said the company should think about whether the board needs members for production and sales. Osterloh said a new company structure should be ready to be presented in September, including a strategy that goes beyond 2018. He is against the idea of raising profits by selling off some of the company assets, such as MAN Diesel & Turbo. "Before we sell anything we will make acquisitions in this area," Osterloh said. Expansion is also his preferred strategy for fixing problems in the United States. He said that to succeed going forward, the company should think about making large pickup trucks. "We want to accelerate efforts to catch up with rivals. To do this, a pickup is needed in the medium term," Osterloh said. As a stop-gap solution, VW has appointed Berthold Huber, a former boss of the IG Metall labor union as interim chairman, pledging to find a permanent chairman quickly. Asked whether Wolfgang Porsche, head of the family which controls Volkswagen, could become chairman, Osterloh said: "I value and respect Mr. Porsche, we worked together in a confidential and close manner in the past weeks, but the structure has to take precedent. The question of the supervisory board chairman still has some time to be resolved."